Sears Holdings (SHLD) has come under extreme pressure lately after a Q4 warning and fears of credit tightening around suppliers. The stock recently bounced back to above the gap down from the December warning, but it is has now closed down for five consecutive days. 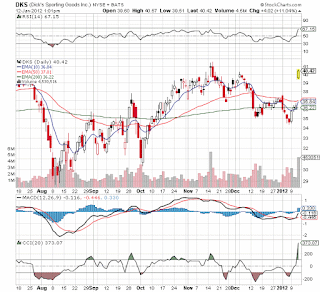 What stopped the free fall to below $30 from a high above $80 in October was news that Chairman Eddie Lampert accepted management fees from his ESL Investments vehicle in Sears stock. Along with other transfers, Eddie obtained over $150M of stock in early January according to this Wall Street Journal report. One has to wonder why a legendary investor like Eddie would take stock in a company like Sears unless he knows that bankruptcy isn't a looming issue. Would Eddie really just throw $150M down the drain? Disclosure: Long SHLD and HD. Please review the disclaimer page for more details. As reported last week, Apple (AAPL) now has a cash hoard of over $97B while generating $17.5B in cash flow from operations in Q4 alone. Yes, that is correct. Apple has more cash than most countries have in GDP. Most investors want Apple to return the cash via a dividend or major stock buyback. Neither are that appealing to me as a typical investor buys Apple for growth. A 5% dividend yield could easily be swamped by a 10-20% loss in normal markets and maybe something bigger if the iPad5 was to disappoint. A stock buyback while seeming cheap with the stock trading at a roughly 10x forward PE, it doesn't provide a lot of value with the company trading at over 5x book value. Besides by the time it gets announced and implemented the stock might soar over $500. After the close on Thursday, networking equipment stocks Juniper Networks (JNPR) and Riverbed Technology (RVBD) reported earnings that sent both stocks lower on Friday. One company missed estimates and focused on issues with carrier spending and the European debt crisis. The other exceeded estimates and talked about a product transition in Q1 leading to a major new product cycle. So which stock was down 18% and which one was down 3% at the close on Friday? That might surprise most investors who read the earnings reports and listened to the conference calls. Disclosure: Long RVBD. Please review the disclaimer page for more details. Don't look now, but copper inventories continue to plunge. Recently breaking below 350K tons at the LME Copper Warehouse according to kitco.com. According to the charts below, inventory levels have hit a 2 year low recently. Hard to tell whether China is stockpiling, demand is increasing, or supplies are struggling. Our focus continues to be that the copper market has yet to see the demand equation of both a strong China market and a growing US market. The US peaked back in 2006 long before China approached current levels. Even in the current scenario of weak US demand, copper has struggled to keep up with demand. Freeport McMoran Copper (FCX) is naturally the best play in copper. Still think the copper market will see prices in the $5-6 range before this cycle tops out. Naturally FCX would see record prices when that happens. Going into this earnings release, investors appeared a lot more bullish on Capital One Financial (COF) than Goldman Sachs (GS). Capital One's stock was trading at 6 month highs and Goldman was near the lows. All the media could focus on was how bad the investment banking and brokerage business was for Goldman Sachs. Management, though, was telling a different story to anybody paying attention. All year Goldman Sachs has been busy buying back stock while Captial One was focused on repaying debt, either signaling that the stock wasn't that cheap or maybe the future wasn't that bright. In our Net Payout Yields Model, these signals were used to switch out of Capital One at the end of December and into Goldman Sachs at the beginning of January. Contrary to the typical opinion in the market about stock buybacks, large caps with strong earnings profiles tend to benefit from buybacks. The media tends to focus on the failures such as Netflix (NFLX) while the winners go unnoticed. The euro-wide composite index of purchasing managers in both services and manufacturing industries improved in January. What? Thought Europe was in a deep recession. Now we're already hearing talk of the downturn bottoming out. The composite index rose to 50.4, a five month high, from 48.3 in December according to Markit Economics. Naturally this wasn't an overly robust report and the gain was partially from a reduction in order backlog. Both sectors saw improvement though the services index was the only one above 50 or signalling growth at 50.5. Manufacturing was still declining but at a slower rate. More importantly is that German manufacturing responded to a lower Euro with growth for the first time in four months. Sure this doesn't mean that Europe is out of the woods already, but the debt crisis clearly isn't having as negative of an impact on 2012 business as most predicted when the year started. 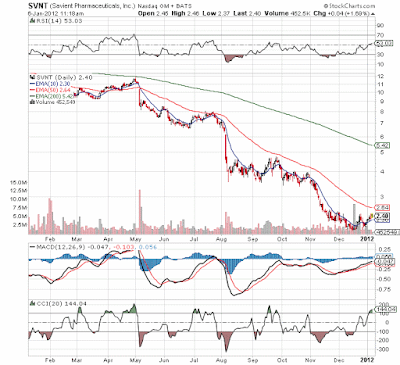 Any followers of this blog know that I typically focus on individual stock research. My goal for 2012 is to spend some more time focusing more on trends in investments and especially more time on retirement options. Interesting article yesterday from the Associated Press regarding trends in 401K plans. Mostly positive trends, but generally basic themes that are incredible that they weren't automatic from the beginning. Disclosing fees wasn't a requirement from day 1? Finally moving towards advice is another better late than never concept. My number 1 frustration remains that the focus is on fees and not performance. Why not focus more on net return and less on fees? I'd rather pay 2% for a fund that makes 20% than 1% for a fund returning 10%. Sure I'd rather get 21% from the first fund with it charging only 1%. Still competition ultimately reduces fees, but net performance should be the focus. After a strong 2009 and 2010, 2011 was a year to forget for this portfolio. The market hit highs around the end of April and this model was soaring to new heights at the time. Many of the holdings had valuations nowhere near the 2007/08 peaks or even close to what would normally be considered rich. Regardless, leverage was reduced since some gains were significant. Then, unfortunately most of the stocks collapsed and even in a few cases approached 2009 lows. With too much leverage left, the model was hit very hard. The good news is that valuations started the year as attractive as during the financial collapse of 2009. The portfolio remains overweight on the global growth theme. Most of the stocks in this sector trade as if emerging markets are headed towards a recession instead of continued growth. Yesterday, Kraft Foods (KFT) provided an update on fiscal 2011 results. Operating EPS was guided to $2.28 or slightly above analysts estimates. Naturally the company got a lot of media attention. What didn't get a lot of attention is that Kraft now trades at a rich multiple for a company with just 6.5% organic revenue growth. The forward PE (2012) is now over 15. A very rich price when the S&P500 trades at roughly 13x 2012 estimates. Kraft is a solid company, but the PEG ratio sits at 1.7 with a 5 year growth rate just short of 10%. Also, the dividend yield has dropped to only 3.1% with the stock jumping from the low $30s at the start of October to nearly $39 today. Is Kraft worth paying that much? That would be my major concern when investing in the stock. Friday was a wild day in the metallurgical (MET) coal sector as Patriot Coal (PCX), Walter Energy (WLT), and Norfolk Southern (NSC) all made noteworthy announcements. With Patriot Coal and fellow met coal producer Alpha Natural Resources (ANR) both sinking more than 10%, one would assume that all of the announcements were negative. At first glance, this seems like good news for the US Virgin Islands. 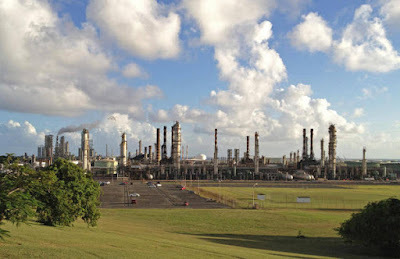 Why in the world would a beautiful Caribbean island want a disgusting, old refinery? Why not tear it down and build a golf course? Or at least that is my thought. The Hovensa, a joint venture between Hess (HES) and Petroleos de Venezuela S.A, refinery in St. Croix is being closed due to various reasons such as lower demand since the financial crisis and modern refineries in the emerging markets. Also, another reason for the closure is that it is an oil-fueled operation leaving it at a disadvantage versus one fueld by nat gas. Isn't this just short sighted? That advantage will flip flop numerous times over the next 10-20 years. Always interesting to see what the major miners such as BHP Billiton (BHP) are producing and developing. Most noteworthy for BHP are the iron ore, met coal, and copper production figures from their 2nd half 2011 production report. All 3 commodities are in hot demand in China and BHP had all the incentive in the world to increase production in 2011 over 2010. India's headline inflation plummeted in December following the previously announced sharp drop in food prices. The inflation figure came in at 7.5% down from 9.11% rate reported for November. While generally inline with consensus, the reading provides solid confirmation that India has been able to use monetary policy to slow the inflation rate. Now the real question is how low the rate will drop and whether this will provide enough room for the RBI to drop interest rates. Simple math suggests the rate will see further drops as such a huge drop suggests month over month inflation is flat lining. Of the components, manufacturing inflation remained at 7.4% while fuel inflation only saw a modest decrease to 14.9%. Just don't see how fuel inflation can remain so high if oil is virtually flat this year. Only currency could explain stubbornly high prices and that will reverse in due time. After watching a Mad Money feature on little known Key Energy Services (KEG), it got me to wondering what other oil service plays I didn't really know. Everybody has heard of the big players in the sector such as Haliburton (HAL), Schlumberger (SLB), and Baker Hughes (BHI). What about the second tier companies? Hydraulic fracturing and horizontal drilling remain all the rage, even with natural gas prices plunging to 10 year lows this year. Even with expected rigs drilling for natural gas declining, it wouldn't be surprising to see them move directly into oil shale plays as oil remains around $100. Not to mention one needs to be careful when focusing on the current price of natural gas as future prices on the NYMEX remain in the $4-5 range. 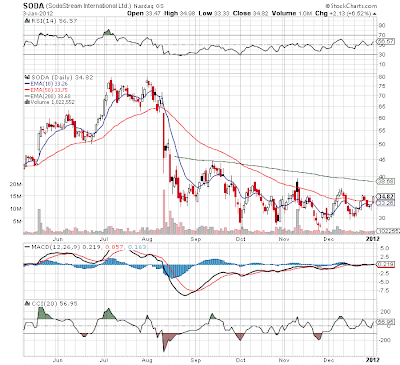 Read full story on Seeking Alpha. Back in July of last year, I did a series of articles about companies with relatively cheap valuations that were expecting the fastest earnings growth in 2012 (See 1, 2, 3, 4). These companies offered the potential for huge stock gains if earnings estimates were met. Now as global stock markets appear ready to head upwards, it seemed like a good time to revisit this list. It is always a good idea to check the outcome of a previous concept. How did the stocks perform? Were earnings estimates met? What about the valuation now? Read full article on Seeking Alpha. Disclosure: Long CRZO, MTW, and TEX. Please review the disclaimer page for more details. December was yet another solid month on a absolute basis, with a 0.53% gain for this portfolio, but on a relative basis the portfolio underperformed the benchmark S&P 500 that was up 0.85%. For 2011, the portfolio was up 6.82% versus 0.0% for the benchmark. Despite all the volatility in the markets, the Net Payout Yields Model had a good absolute and relative performance for the year. Since this portfolio is not dependent on fundamental analysis or economic forecasts, it isn't always prudent to focus on the prognosis for the stock market and economy. The whole goal is to find high net payout yielding stocks and then harvest the benefits of huge dividends and stock buybacks. In a way, let the management teams earn their money while investors enjoy the spoils. After trading down 2% in after hours due to a warning from competitor Big 5 Sports (BGFV), Dicks Sporting Goods (DKS) is up 11% now based on the announcement of a $200M stock buyback and reiterating of Q4 guidance. It appears that most market participants were expecting at the least a earnings miss. Instead they got a big buyback to support the stock price. This is what happens when investors focus too much on the weak competition. Difficult to extrapolate too much especially when it's just a regional player as well. DKS did lower the upper guidance by $0.01, but that wasn't a shock. Comps are now expected to be flat versus the original expectation of slightly up. The buyback is interesting as I don't see DKS stock as incredibly cheap, but the company is one of the few retailers that has the cash on hand. Evidently the 3 year funding program initiated by the ECB at the end of 2011 was more crucial to the bond markets than anybody originally thought. Spain issued twice as many 3 year bonds as planned at a yield significantly lower than last year. The 10 billion euros were priced at 3.38% compared to 5.18% when auctioned in December. Italy placed 12 billion euros and greatly reduced rates as well. So much for the funding concerns that Europe was suppose to face in 2012. The ECB liquidity measure has been a boon for at least bonds 3 year or less in duration. Now extending bond sells to 5 & 10 years might be an issue. For example, Italy still has a 10-year yield of 6.6%. This news makes me wonder how the Corzine trade at MF Global would've faired now considering the drop in rates. Those 1 year Italian notes would've paid handsomely at this point. Some more good auctions like this and the market will put Europe on the back burner and start focusing back on fundamentals. 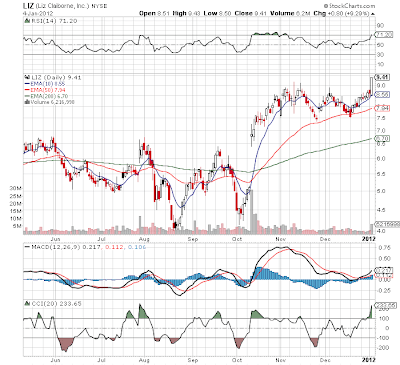 Liz Claiborne (LIZ) stock has rallied back 3.5% today from the warning after the close on Monday that led to a 13% drop yesterday. See our note from 2 days ago. Apparently at the ICR XCHANGE conference today, CEO presented some bullish 2012 comps news on the 3 brands. See below. He also reiterated that the majority of any decline in EBITDA expectations were due to a reduction in the expected cost cuts reached in 2012. Anybody following LIZ should browse through the presentation on the website. It provides some good summaries and expectations for the global expansion of the 3 brands. LIZ is almost like a biotech firm with 3 promising drugs that just got FDA approval. That's the feeling one gets when reading about these brands potential and how they were all held back with the restructuring in LIZ over the last 3-4 years. Interesting charts on mega caps Intel (INTC) and Pfizer (PFE) presented on Fast Money. It appears that after roughly a decade of no movement, at least some of these huge stocks are starting to break out of long term confined patterns. These stocks will help push the major indices up if the breakouts continue. This is interesting as some mega cap stocks such as INTC appear on the Net Payout Yield list. The yields are incredibly high considering that the 10 year yield remains below 2%. INTC alone has a 3.3% dividend yield without counting any buybacks. Shouldn't be that much of a surprise that investors are finally catching on to these attractive yields. After the close Liz Claiborne (LIZ) dropped over 11% on a release that the CFO would be leaving in March and the EBITDA numbers would be slightly lower than expected. Not surprising to see the stock dropped based on those data points, but it shouldn't shock anybody that LIZ has struggled to hit numbers. The stock doesn't trade based on them exceeding guidance so a slight guide down for next year really shouldn't hit the stock that much. More important is the fact that both the kate spade and Lucky brands had huge comp growth in November and December. In fact, kate spade had 39% comp store growth in December after 81% in November. That is the highest number I've seen. Note: This was my submitted title to Seeking Alpha, but alas the editor changed it. Must not be a fan of Storage Wars. As cloud computing (data centers), smartphones, and tablets continue stratospheric growth rates, the market needs faster, more reliable, and less power-hungry storage options. The digital junk has to be stored somewhere, and these new devices don't have the storage capabilities of traditional desktop computers loaded with large hard disk drives. Liz Claiborne (LIZ) surged 9% today on news that its new name would be Fifth & Pacific and trade under the symbol FNP beginning May 15, 2012. Wow, guess the problem all along was a name associated with an old business line. Guess people really liked the new name. My wife seemed to think it sounded like a hip California concept. She sure knows fashion better than me. "While it's difficult to replace an iconic name like Liz Claiborne, we believe that Fifth & Pacific Companies telegraphs who we are today – taking inspiration from New York and California , while describing our reach and our potential. From New York to Los Angeles to Shanghai and beyond, our intrinsically American brands have global appeal, serving customers worldwide with high quality and imaginative product," said Liz Claiborne Inc. Chief Executive Officer William L. McComb . The dividend trade sure seems played out so I was shocked to see Cramer still pushing dividend stocks on Mad Money. Still no mention of Net Payout Yields. Still ignoring buybacks. Why? What is a dividend after all? Isn't it just the company returning capital to shareholders? Aren't investors more concerned about where the dividend money is coming from? This is exactly where investors apparently get lost. What matters is the earnings yield. The profits divided by the market cap. Is FirstEnergy (FE) a better investment because it pays a large portion of earnings to shareholders or is Apple (AAPL) better because it grows a lot faster and trades at a lower PE? Does AAPL become a better investment by paying a 5% dividend? Everybody knows it can afford such a yield. Lately investors have become confused with what a company earns and what the company pays out to shareholders. Don't get those concepts confused or you'll get burned by the apparent latest bubble. Don't know anything about Monness, Crespi, Hardt $ Co., but according to StreetInsider.com the company issued a note today indicating that Sodastream (SODA) had a great Christmas. This shouldn't be too surprising to anybody that follows SODA. The company has been reporting blowout numbers all year, but the stock cratered due to conservative guidance for the 2H of '11. The company already blasted past estimates in Q3 though it didn't help the stock. According to the report, Monness issued a report showing a recent survey of more than 1,500 retail locations around the US including Target, Staples, Best Buy, JCPenny, and Macy's showed very little supply in stock. The items were evidently selling lot hot cakes. The analyst estimates $.28 in Q4 which is above street estimates, but considerably below Q3 of $.42. Don't be shocked if SODA reports more mind boggling numbers this time as well. Who Benefits From The Resurgent Deep Gulf Drilling? Raise your hand if you realized that by early 2012 there will be more deepwater rigs in the Gulf of Mexico than when the BP spill occurred. According to ODS-Petrodata, 40 deepwater rigs will be in the Gulf compared to 37 before the spill. As an investor and especially one that has invested in the sector, this news caught my attention as something the general investing public doesn't understand yet. So what stocks will be able to take advantage of this trend in 2012? First, companies that focus on drilling deepwater wells in the Gulf could benefit the most with the rising demand and possibly less competition as many rigs fled the area. Second, any companies in the deepwater segment should benefit with rising sector demand and higher global utilization lifting all day rates regardless of location.